Ever tried typing on your iPad’s keyboard with your thumbs while holding the iPad in your hands? Talk about awkward. Well, there’s an easy way to make the iPad’s keyboard a lot more thumb-friendly: by splitting it in two. A simple gesture is all it takes, provided you’ve got a key (no pun intended) setting enabled. You can also split the iPad’s keyboard by tapping and holding the keyboard key. Press the Home key, then pull up the iPad keyboard in any app you wish (such as, say, Safari). Now, tap and hold the keyboard with two fingers—one on each side of the keyboard—and spread your fingertips apart. As you do, the keyboard will split in half. Another option: tap and hold the keyboard key in the bottom-right corner of the keypad, then select Split. Want to make the keyboard whole again? Just tap and hold each half of the keyboard with two fingers and push them back together, or tap and hold the keyboard key and select Merge. 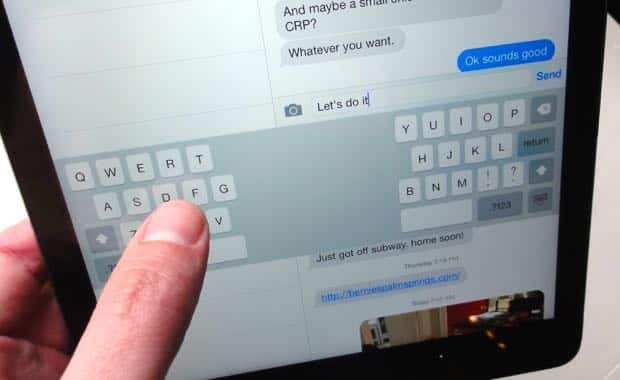 Still having a tough time typing on the iPad with your thumbs, even with the keyboard split in two? You could also try undocking the keyboard so it floats in the middle of the screen. Just tap and hold the keyboard key again, then select Undock.